I've been to Spring Mountain Motorsports Ranch several times and driving SS Camaros and C5 Z06 Corvettes. 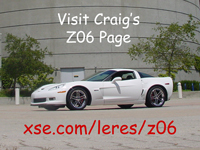 In December of 2006 I drove a red C6 coupe and a Silver C6 Z06. One technique taught at Spring Mountain is heel and toe downshifting. With the C6 Corvette, the combination of narrow shoes and pedal spacing can make it difficult to hit the throttle. To make this easier, they attach an aluminum plate to the throttle in some of their cars. Here are pictures of the throttle extension plate used at Spring Mountain and the one I made for my Z06. Note that installing a throttle extension plate makes it easier to unintentionally engage the throttle while braking; this modification isn't for everyone. My plate is made from 1/8" ABS plastic from TAP Plastics. I used my router (a Ryobi R160) as a mini-router table router to shape the final part from a template I made. My plate is about 5/8" wider on the left edge. I would have liked to buy a spare but it is not sold except as part of the throttle actuator control assembly so I modified the stock accelerator pad. I used a Dremel tool and belt sander to remove the raised portions of the stock pad. After attaching the new 1/8" ABS plate, it's only slightly thicker than stock. I attached the plate to the accelerator pad using flat head (black oxide) 10/32" X 5/8" hex socket screws, stainless washers and Nylocks. Later I decided it would be fun to fabricate an entire throttle from aluminium at my local community college welding shop. I cut the pieces from 1/8" sheet using their PlasmaCAM table and then TIG welded them together. The shape is similar to the stock piece except the left side is about 1/2" wider. I created holes to make it look like the clutch and brake pedals. The finished part is sandblasted. It's attached to the throttle position sensor using a spacer and a 10/32" X 1-1/4" screw, nut and washers. The left side of the throttle pivots on the spacer and the right side on the screw. The result is solidly mounted with little play.